SVRA @ The Brickyard, June 2017 — Automotive Restorations, Inc.
Harvey was on the fence...but he agreed to one more. As usual, he was ready as we loaded the trailer for our long serving and loyal pal Harvey’s last Vintage race!! Harvey has years of driving SCCA cars, Vintage cars and our Kenworth under his belt and he is a man you can count on. Harvey did the driving, some fixing and the cooking. Brian Rechtiene worked the wrenches to good effect. After the last checker fell, Harvey turned in his clipboard & watches...ah retirement...of course he got the rig home...as usual!! Arrive on time, setup and get ‘em tech’d. Harvey and Brian know the drill and have the Montana and Lenehan Swift S2000s and the Jim Lenehan Porsche 914-6 ready and waiting. 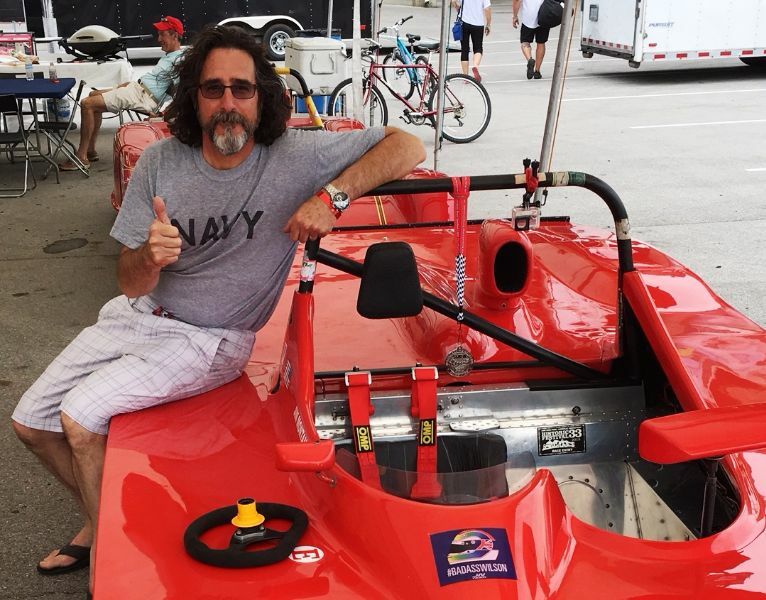 First…A little track touring to see where it all goes… Then Jim Montana takes time to bond with his Swift Sports 2000……and not long after ….. we find both Jims on the grid and ready for some Brickyard speed!!! Those S2000 “drivin’ Jims” seen here are both right on pace as they each cross the start-finish line right on cue, lap, after lap, after lap… rewarding crewmen Brian and Harvey with a certain comforting confidence of conclusion!! Not a wheel out of line and...well…as the race closed in on conclusion we were all feeling pretty good about the outcome………?? “The Jims”...Lenehan and Montana did very well finishing 1 and 2 in Group 7, class VS2. Their feature race went without a hitch and our guys did a great job. Rewarding for both driver and crew. Thanx Guys! It can get a bit lonely at times out there in the wilds of Indy after you’ve run away from the pack. Mr. Lenehan at it and on it on track per above. Skies are threatening but Jim Lenehan’s getting things just right and on the leaderboard in his Porsche 914-6. Above; The rapid Lenehan Porsche 914-6 crosses start finish at speed in the chase for a podium. Result? Photos worth a thousand words to the right and left tell the tale best! Well done Jim!! Ah Indiana farming...with all those fields and cows--What else for a victory drink at Indy makes more sense than milk? Then, yea, just keep the bottle. Note the top 3 group 8 cars all within a second; great racing! Here’s Harvey … and our drivers having a Harvey-prepared lunch. Photo left is about 20 years ago, far right is SVRA Indy 6/17. Talk about aging gracefully!! Let’s end where we started. Great weekend SVRA and thank you Harvey Thompson for so many more! !